Western blotting analysis of extracts from 293 cells, untreated (-) or UV-treated (100 mJ, 2 hr; +) or HCT 116 cells, untreated (-) or neocarzinostatin-treated (NCS, 10μM, 1 hr; +) using Phospho-Rad50 (Ser635) Antibody (upper) or Rad50 Antibody #3427 (lower). 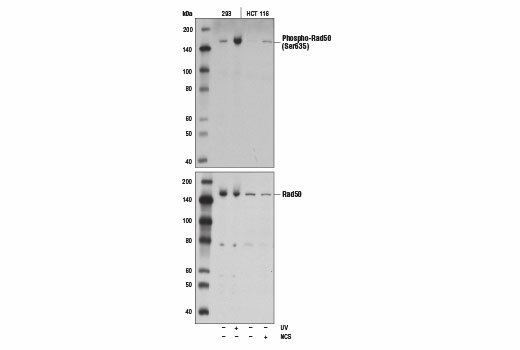 Phospho-Rad50 (Ser635) Antibody recognizes endogenous levels of Rad50 protein only when phosphorylated at Ser635. Polyclonal antibodies are produced by immunizing animals with a synthetic phosphopeptide corresponding to residues surrounding Ser635 of human Rad50 protein. Antibodies are purified by protein A and peptide affinity chromatography. The DNA repair protein Rad50 is a member of the structural maintenance of chromosomes family (SMC) and plays an important role in cell cycle checkpoint signaling and double-strand break repair in response to DNA damage (1-4). Rad50 forms a complex with Mre11 and Nbs1 that becomes activated in response to DNA damage (3). In normal human cells, the MRN complex acts to tether linear DNA molecules, providing a flexible link between DNA ends (1). Genomic instability and cancer have been shown to develop in cells with genetic mutations affecting the proteins in the MRN complex (2). ATM-dependent phosphorylation of Rad50 at Ser635 in response to DNA damage is important in regulating downstream signaling, DNA repair and checkpoint control (5). de Jager, M. et al. (2001) Mol. Cell 8, 1129-35. Elledge, S.J. (1996) Science 274, 1664-1672. Lee, J.H. and Lim, D.S. (2006) FEBS J. 273, 1630-36. Teng, S.C. et al. (2006) J Mol Histol 37, 293-9. Gatei, M. et al. (2011) J Biol Chem 286, 31542-56.